Looking for Sinus Infection Treatment? A sinus infection or sinusitis often follows an earlier respiratory infection, such as a common cold, tonsillitis or laryngitis. 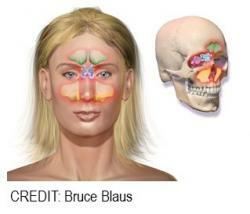 There are four sinuses, which are air pockets or cavities around the eyes and nose in the skull. Inside the nose, tiny hairs called cillia protect the body by trapping particles before they enter respiratory system. When a particle, spore or bacteria slip past the cillia and become lodged in one of the sinus cavities, mucous builds up, inflammation occurs and chances are good sinus infection treatment is in order. When you visit the FastMed location nearest to you, a medical professional will evaluate your condition and symptoms. For acute sinusitis, if a bacterial infection is present, antibiotics are the standard course of treatment. Decongestants and pain relievers may also be recommended. If you also suffer from seasonal allergies, there may be additional solutions to help relieve the inflammation causing pain and pressure, such as a nasal steroid spray. During your visit, discuss how to use over-the-counter or prescription decongestant nose drops and sprays. You should use these medicines for only a few days, as longer term use can lead to even more congestion and swelling of your nasal passages. If you have asthma, a sinus infection can make your symptoms worsen, so please discuss your medical history during your appointment at FastMed Urgent Care.